The premise of the One-Minute Elevator Speech Contest https://www.ascb.org/2016meeting/elevator-speech-contest/ is simple: The elevator door closes and you’ve got a trapped audience – a U.S. Senator, your dean, or Taylor Swift. Go for it! Sell your science in 60 seconds! If you’re attending ASCB 2016, you can sell your science in 60-second elevator speech selfie video and then compete for a pair of very cool, highly coveted Bluetooth headphones. 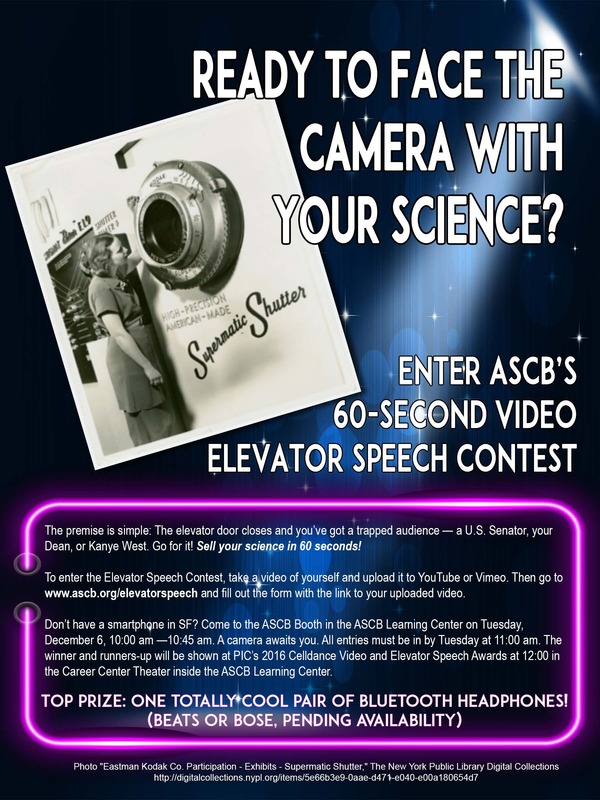 To enter the all-video One-Minute Elevator Speech Contest at ASCB 2016, make a selfie video of your speech, upload it to YouTube or Vimeo, and then go to www.ascb.org/elevatorspeech to fill out the form linking to your uploaded video. Don’t have a phone or a camera to record your video in San Diego? Come to the Elevator Speech Contest Entry Point at the ASCB Booth in the Learning Center, Tuesday morning where a camera awaits you,10:00—10:40 am. At noon, the winning video and the top runners-up will be shown in the Career Center Theater inside the ASCB Learning Center at the Celldance, Elevator Speech, & COMPASS Comics Awards.